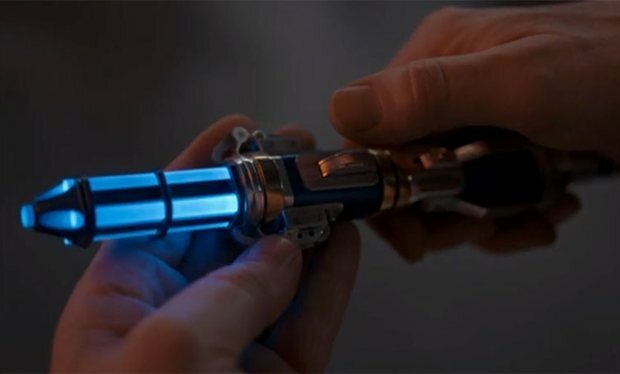 Having shed the controversial sonic sunglasses, the twelfth Doctor has now obtained a brand new sonic screwdriver with which he will no doubt unlock locks, disable robots, and maybe even unscrew things. The screwdriver has been something of a staple of Doctor Who for some time, so with the new addition to the team, let’s take a look back at the sonic screwdriver through the ages! 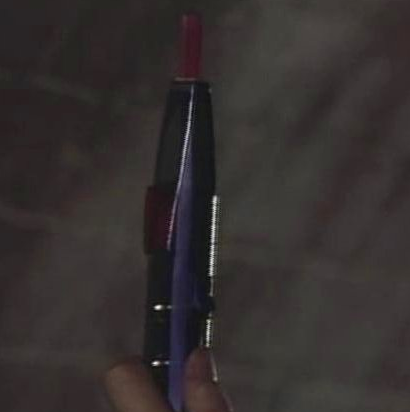 First appearing with the Second Doctor in Fury from the Deep (1968), the sonic originally looked like a small metallic pen with a light on the end. 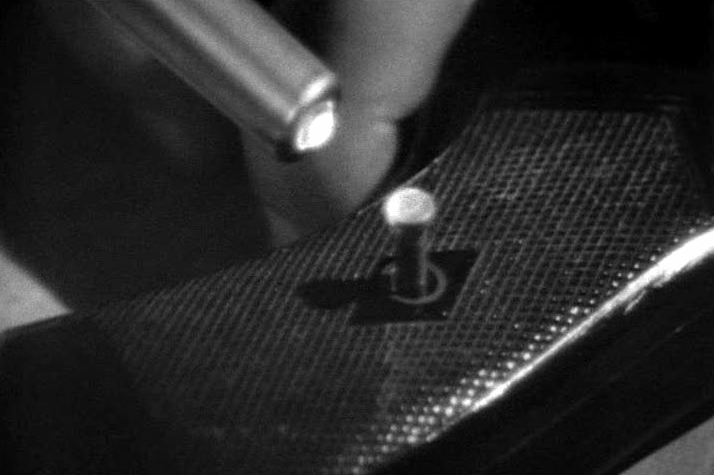 Indeed, its initial functions seemed to actually be those of a screwdriver, in that it was used to unscrew screws. It opens hatches and control panels and is generally a useful little gadget. But it wasn’t long before the device’s uses expanded. Just two stories later in The Dominators (1968), the Doctor uses it to cut his way through a wall and build a small tunnel. 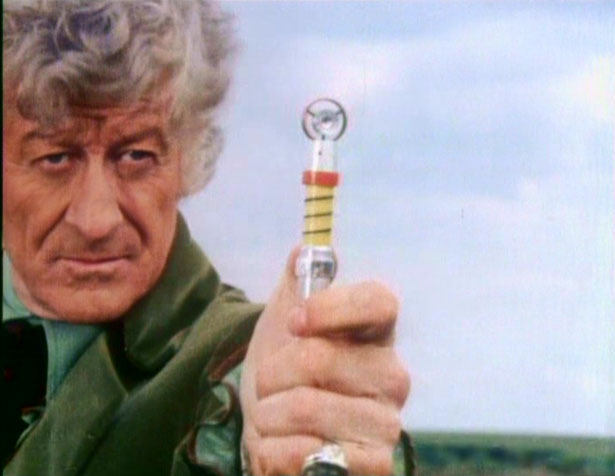 The Third Doctor’s sonic screwdriver was getting more towards what would become the ‘classic’ look of the famous multi-tool. It was metallic with a round head but with black and yellow stripes around the ‘neck’ and red ring about the top. It had a removable head which the Doctor would change with others, each performing a different function. 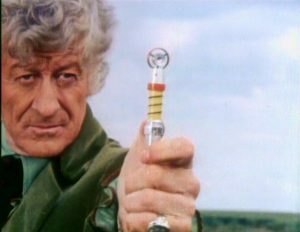 Over the course of his adventures, the Third Doctor used the screwdriver for everything, from scanning for land mines (The Sea Devils ), setting fire to swamp gas (Carnival of Monsters ), to, as always, opening doors and panels. Technically first used by the Third Doctor in Frontier in Space (1973), this screwdriver was used much more by Tom Baker’s Doctor. This model was sleeker, simpler, and probably the best known version from the classic series. Gone were the black and yellow stripes, leaving the thing looking more like an actual tool you might find in a Time Lord’s toolbox. It was, alas, destroyed in The Visitation (1982) by the Terileptils who locked the Fifth Doctor in a cell before blasting the sonic to bits. Mournfully, the Doctor laments “I feel as though you’ve just killed an old friend.” The Fifth Doctor went on with his adventures ‘hands free’ as the Tenth later teased him. This model made a very brief return in the 1996 TV movie with Sylvester McCoy (who accidentally used it back to front!) and Paul McGann. It had one final outing in the Eighth Doctor’s final adventure, Night of the Doctor (2013). Lacking a screwdriver, the Sixth Doctor managed to improvise and briefly flirted with a Sonic Lance in Attack of the Cybermen (1985). It had a variety of functions, much like the screwdriver, but was short lived as the Doctor had to leave it behind in order to help blow up some Cybermen. It was seen being used to cut wires, open doors, and heat up explosives. 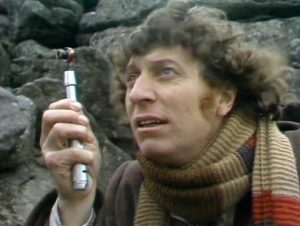 The Sixth Doctor went on to use similar devices in his audio adventures, but rarely if ever used the classic screwdriver. His lance, however, is still featured with his action figure. Of questionable canonicity, the Eighth Doctor’s steampunk sonic has been used in Big Finish’s audio adventures artwork and promotional material as well as being described briefly in the episodes. 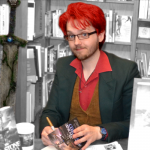 It has also been appearing in some of the Eighth Doctor comics. Created by Weta Workshop (famous for The Lord of the Rings), this new sonic had a wooden handle and brass fittings as well as a blue light at the tip. 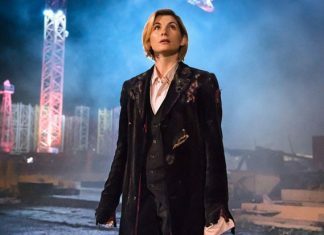 It has something of a ‘homemade’ look to it, and does give that sense of it being a device the Doctor has been tinkering with and changing repeatedly over the years. It is something of a fan favourite and there have been calls for replicas to be produced. None have materialised thus far to my knowledge. Designed as a sort to look something in between the classic design of the third Doctor’s onwards and the Ninth Doctor’s screwdriver, this one lost its head. The red or silver round bit on the end was removed in favour of a red light, though it still seemed to function in much the same way as the old style one, with a sliding neck and base. 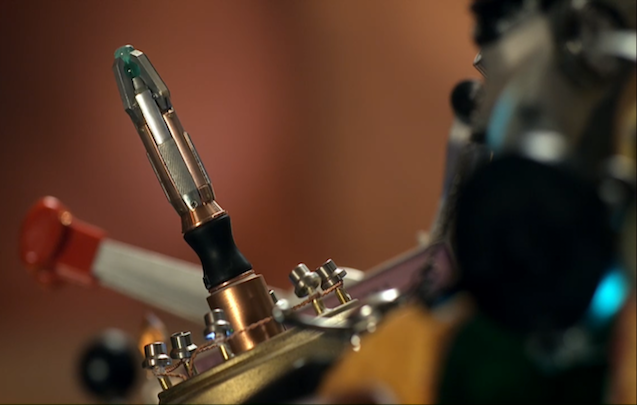 In The Day of the Doctor it was established that all the screwdrivers are, in fact, the same screwdriver in different casings. 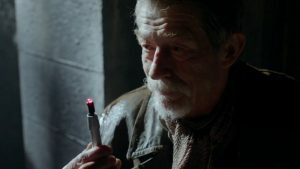 Allowing the War Doctor to begin a calculation that the Eleventh Doctor’s sonic finishes. Though, one must wonder if that means the data on them is stored in the TARDIS to compensate for the fact that it has been destroyed a number of times in the interim. 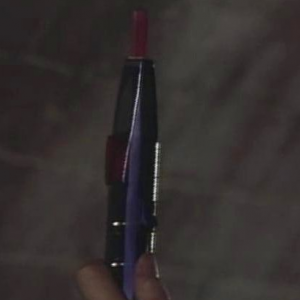 When the show returned in 2005 with a new Doctor, a new sonic screwdriver was called for. This one had a “cracked-porcelain” texture on the handle, metal at the tip and a blue light on the end. The sonic was brought back ostensibly for time saving – in the classic series one had four or even six episodes in which to get the Doctor in and out of tight spots. Now with only a single (though sometimes double) episode per story, it became necessary to give him his trusty multi-tool again. Even the Master seemed a bit jealous of the Doctor’s screwdriver and ended up making his own Laser Screwdriver. Which, really, was just a laser gun he decided to call a screwdriver. Probably just to annoy the Doctor. Though it slowly became something of a magic wand, it did burn out from time to time. 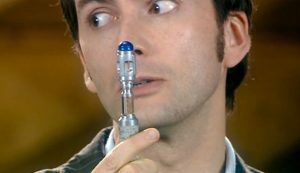 In Smith and Jones (2007) the Tenth Doctor overloaded an X-Ray machine and, in the process, overloaded the screwdriver, too. Eventually, the Eleventh Doctor burned it out completely in The Eleventh Hour (2010) whilst trying to attract the attention of Atraxi. With its flick-to-extend action, green light top, and bronze finish this newer model looked again a little like it had been a bit cobbled together. Somewhat resembling the cluster of junk look of the Eleventh Doctor’s TARDIS interior, this sonic was a serious shift from the previous model. What’s more, this sonic had a plethora of new features. It could be voice activated, and it could, eventually, be psychically operated. Point and think and the sonic does the rest. While this does make for a more desirable item, it has come under fire for being far too much of a get out of jail free card. The Doctor could use it to analyse his surroundings and by staring into it, he could decipher various facts about the environment. This could save some time in the script, of course. This screwdriver was the one he eventually tossed to the child Davros when the Doctor inadvertently ended up on Skaro (somehow). He abandoned the screwdriver for some time after that, favouring the now infamous sonic sunglasses. Initially used to get past Davros’ security, the sunglasses are a sort of ‘stealth’ sonic device. Wearable technology, as the Doctor says. 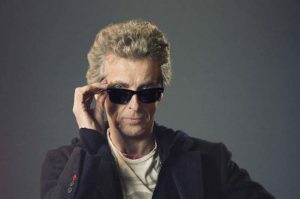 Claiming that the screwdriver would “spoil the line of your jacket”, he adopted the sunglasses for the rest of the series, using them for everything the screwdriver would have been used for. The sunglasses made for some very cheap merchandise, no doubt. And now here we are with the latest model in the line. It is TARDIS blue, has lights that go around the head (as if it were, shock horror, screwing something in), and a much bulkier look to it. Time will tell if this new look screwdriver will be a hit or a miss.